This Friday August 1st, the third annual Working With Artists Member Show opens with a reception from 6-9PM. Located as part of Block 7 in the Belmar Shopping District , Working with Artists is a non-profit organization focusing on the photographic arts. Providing classes for children and adults in studio and digital photography as well as their FLASH Gallery, WWA offers an opportunity to build photographic knowledge in the Denver metro area. The piece I will be showing as part of the show is Snowy May Day , featured in May on the blog. The image was taken on May 1st, in Denver’s Washington Park during a spring snow storm. It has been quite well received by visitors to the website as well as those who saw my promo card in the mail. One of the comments I always get when someone sees the promo card is that they didn’t realize it was in color since they only saw it on the website. Be sure to stop by and check out the framed version and see for yourself, as well as the many other images displayed as part of the members show. If you can’t make it on August 1st, the show runs through September 6th. FLASH Gallery is located at 445 South Saulsbury in Lakewood, Colorado and is open Noon-8PM Tuesday through Friday and Noon-6PM on Saturday and Sunday. Once again I have a limited edition print available through an auction. This time the proceeds benefit Heide Medina who is battling a new round of cancer. Heide previously beat breast cancer, but it has returned and spread to other parts of her body. As medical bills can be quite expensive and insurance limiting all of the proceeds from the auction will help defer the cost for treatment she is currently receiving. Take a look at some of the items available, and this is an opportunity to win a matted print which is ready to frame. Being in Lake Tahoe I thought it would be appropriate to make the Linking the Week site for this week the Tahoe Rim Trail Association . The association was founded nearly 30 years ago to develop a trail on the rim around Lake Tahoe, which opened in 2001. At 165 miles long, the trail encompasses two states and on the western side of the lake the trail overlaps for about fifty miles with the Pacific Crest National Scenic Trail . As it is a rim trail the elevation varies slightly but does range from 6,240 feet at the outlet of Lake Tahoe on the north end to over 10,000 feet at Relay Peak in Nevada. The next time you are in Lake Tahoe, be sure to look at the ridge around the lake and realize a trail is there as well. If it is the summer months, you will know people are at various points along the route either doing part of the trail or the whole trail at once as they join the 165 mile club. While my time at Lake Tahoe has been nice, the Telegraph Fire near Yosemite National Park has been funneling smoke north towards Lake Tahoe. I have still been trying to take some pictures even though my optimal locations are not working. I will share some of the image I took later this week. 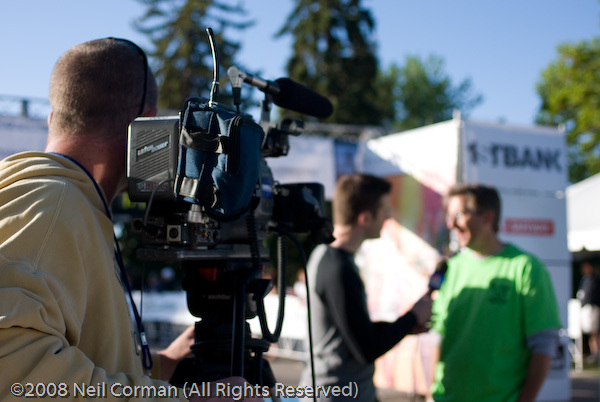 As I was looking through some images on my hard drive I found some which I took at the Colfax Marathon this past May. Held on a Sunday morning less than 12 hours after I returned from Las Vegas , it was a short amount of time at home prior to the 6am start of the race. This year the marathon and half-marathon had different routes based on feedback from the runners in past years. The main change was the start and end of both races are now located in Denver’s City Park . After the signal for the start of the race the runners headed through City Park and the marathon participants went west towards Lakewood to later make their way through the streets of downtown Denver and back into City Park. The half-marathon participants headed east on Colfax towards Aurora. At first I concentrated my location in City Park, but after the first few half-marathon racers finished I decided to go downtown and found a few racers heading down 17th. I walked from Broadway the length of 17th northwest towards Union Station and finally settled for a spot on the corner across from the station to capture the runners heading by on their final few miles of the race. Spending an hour in downtown Denver on a nice May morning was nice and quiet, and sitting on the pavement I was able to capture some images of the runners. During the time situated in downtown, I found some of the runners were quite serious while others flexed their muscles for the camera as they continued to make their way to the finish line. 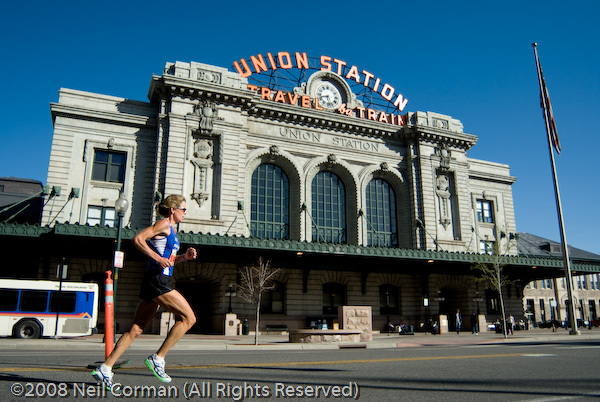 A marathon runner heads past Union Station on their way through downtown Denver during the 2008 Colfax Marathon. Lisa Wareham is the featured f/22 photographer for the month of July. Like Lesley last month, I met Lisa in Missoula in the summer of 2007. Watching Lisa work and seeing the result of her creative vision was a treat and was something many of us looked forward to seeing when our assignments were due. At this time, Lisa is living in Butte, Montana pursuing her own photography career and also recently started the Butte Daily Photo photo blog earlier this year. I had the opportunity to ask Lisa some questions recently about her career in photography and the direction she is moving, which makes up this months profile. When did you get started in photography and what started your interest? I’ve been taking photos for a little more than four years. Photography was something which always interested me, but I never had the chance or knowledge to experiment with. When I was a freshman in college I had a few more credits I needed to take. I searched online for the different art classes, and the beginning photography course came up. It was already the first week of class, and I added the course 15 minutes before it started. There was a wait list of about 20 people, but I went anyway. The instructor told us we needed to buy a 35mm camera and about $100 worth of slide film. I bought a camera online on a whim, hoping I would get into the class. I brought the camera to class and the teacher added me to the roster. From then on I became more and more interested in photography as the weeks, months, and then years went on. It’s funny how taking a chance can change the rest of your life. I never thought I was good enough to make a living at it, until I started working for my college newspaper, The Argonaut. It was my first semester as a photographer for the paper. I had to take photos at a powwow, and ended up in the bleachers with a wide shot of the grand entry. I used a long exposure, so the three men in the middle were pretty sharp, while the people circling around them were a colorful blur. This was the first photo after 2 years of shooting which I really thought might be good. To this day it is still one of my favorite photos. What is the current focus of your photography and where do you want to see it going in the future? Funny you should ask that, as that’s exactly what I’m trying to figure out! I really enjoy my studio work, the stuff that has concepts behind it. I think working in editorial photography, doing those kinds of portraits and illustrations would be a blast. That’s the direction I’m leaning towards, though I’m also considering advertising and starting my own portrait business. The only problem I see with the portrait business is that the main thing people want is to look good. I, on the other hand, enjoy the creativity of strange locations and angles. I’m not sure I could handle being stuck in the pretty parks of Butte when there are so many old mine-yards and abandoned buildings. The studio work of still life of food was quite well done and an interesting concept. Have you continued to pursue this direction at all? I’m actually working on trying to find a few odd props for an addition to the food photo essay. It has to do with salmon and how the food industry often adds red coloring to make the fish more appealing to customers. Other than that, I haven’t done much of that kind of work lately. I have been brainstorming ideas and sketching things out, but haven’t had the time to put my ideas together in a photograph. I find it fun and challenging trying to find interesting concepts to photograph. For every 20 ideas there might be one idea that is actually good, and has photographic potential. Which one? Well, I guess my studio work is conceptual, exaggerates, and has humor. I’ve been told by people that it often has a kind of dark humor, such as my food photo essay. My outdoor photos that appear on the Butte Daily Photo are also often kind of dark. I focus on the industrial side of Butte, which is not hard to find! But the history and industrial side of Butte is really the unique thing about Butte. I try as hard as I can to get past the cliché Butte images, such as the mine head frame at sunset and the Finlen Hotel. I do have a few images of the Finlen and quite a few head frames, but I think most of the time I’m successful at getting a unique view of them. So I guess strange or unique perspective is part of my style. The Butte Daily Photo has been fun to follow. What gave you the idea to take on this project and do you have any objectives for it in the future? Well, I started Butte Daily Photo for a variety of reasons. After attending the Rocky Mountain School of Photography’s Summer Intensive and Digital Intensive programs, I sort of had about three or four months of very little camera usage. In fact, it collected dust. So I knew I needed a project that would keep me shooting and get me excited about photography. And so the Butte Daily Photo started. I also started it as a way to get my name out as a photographer in Butte, and also so people from Butte that live elsewhere now could see what’s going on in Butte. I’ve had some nice responses from people from around the country. My goal is to continue this project for a year. It has already been three months, so I’m 25% done. If after that year I want to continue it, then I will. But if I am exhausted with photographing Butte, then I might stop it, or hand it off to another photographer. It also depends on if I’m still living in Butte. I would also like to make a self-published book of the photographs. And even if I don’t sell any, I would love to make a copy for myself and a few friends. Is there any one lesson you have learned while pursuing a career in photography which others can learn from as well? Yes. You have to try! If you don’t put yourself out there, nobody will give you a chance because they don’t know you exist! I had an internship in Spokane a couple years ago with the National Resource Conservation Services. While I was living there, I gave a call to one of the local radio stations and left them a message to see if they had any photographic needs for some of their events. I was scared and nervous to call them. They called me back a week later and wanted me to take photos for the “Hoopfest Wedding.” Hoopfest is this enormous basketball tournament in the streets of downtown Spokane. Every year they choose three couples and they have a wedding on the main court. Anyway, if I wouldn’t have made that cold call, I wouldn’t have had that opportunity. I mean, how many people can say they shot a wedding that took place on a basketball court, with the brides and grooms in jerseys, and a shootout at the end for a honeymoon in Hawaii? The following is two images Lisa recently took. 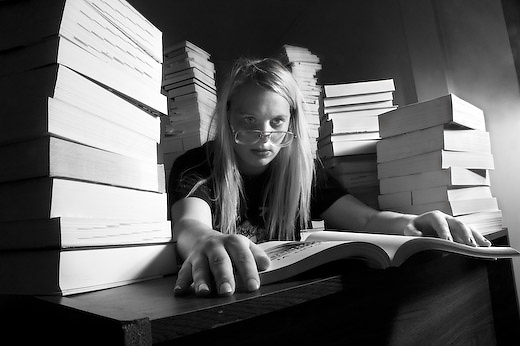 The first is from the Butte Daily Photo blog and the second is some of her portrait work. 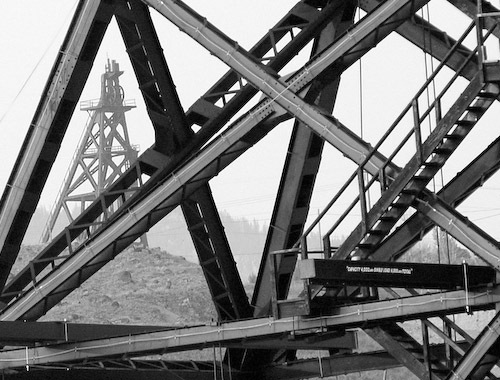 Mine head frames are an icon of Butte, and this photo shows the Bell Diamond Mine (left) through the frame of the Original Mine. Images Copyright Lisa Wareham. All rights reserved. You may see more of Lisa’s work at the websites below. I recommend following the Butte Daily Photo as it is quite a learning experience. Lisa Wareham Photography – photography for advertising, products, portraits, weddings and events. Butte Daily Photo – Your daily photo fix. Butte style. I hope you enjoyed this months interview with Lisa Wareham and looking at some of her work. Be sure to check back next month for another f/22 photographer profile. Earlier this week the 2008 Major League Baseball All-Star Game took place, marking the unofficial half-way point to the season. The all star game is hyped as counting since it determines who gets home field advantage during the World Series in October. There are numerous flaws with this since the voting for the game is a popularity contest instead of being filled with the best players through this point in the season. Additionally the all star game is only two days after games were held on Sunday. While this isn’t an issue for position players, it does become a factor for pitchers who pitched on Sunday as it limits how many pitches they may throw. The all star game should be a place to put on an exhibition of good pitching, fielding and hitting for the fans who follow baseball. Leave the home field advantage in the World Series to the team who has the best record in baseball during the 162 game regular season instead of one game which is a popularity contest. The team which plays their heart out during the season deserves the reward. Now I have said my piece about the all star game, lets look back at the predictions I made prior to the start of the season . There have been quite a few surprises including in the AL Central where the team I follow is situated in first place at the break. In the AL Central I stated the Tigers would win it, and the Indians would be the wild card. As of today the Tigers are in 3rd place, and the Indians in last. The surprise team in all of baseball so far are the Tampa Bay Rays who have been tetter-tottering in and out of first place in the AL East with the Boston Red Sox. Some people at this point like to change their predictions based on how the season has played out to this point, and why should I be any different. Here are my revised picks for the season. A few weeks ago my dad found an interesting site at Baseball Prospectus which calculates the odds of a team winning their division or becoming a wild card team on a daily basis. Check out the postseason odds and see your favorite team is calculated to finish the season. Leave No Trace is a common outdoor ethic towards the stewardship of the outdoors land we enjoy. As it is summer and the time when most people enjoy the outdoors, LNT is the linking the week site for this week. The ethic of leave no trace is best practiced by following the principles which are widely accepted. While many of these seem like common sense, even on a dayhike it is not uncommon to see people doing the exact opposite of what is stated in the principles. Take the time to check out the principles before your next journey whether hiking, camping, mountain biking, snowshoeing or anything else in the open spaces we enjoy. This past weekend I spent some time at the Cherry Creek Arts Festival , located here in Denver, Colorado. For three days 200 artists from around the country exhibited their works at what has been described by some publications as the number one outdoor arts festival in the US. It is estimated over 350,000 people made their way to streets of North Cherry Creek this year for the festival. Just prior to making my way through all of the exhibitors the wind picked up and some rain started to fall. While not ideal for the artists, the rain did bring some relief to the near 100 degree temperatures. As the showers let up, I was walking by one of the music venues with 49 Floors playing. Liking the sound, I decided to stop for a while and enjoy the music. With a mix of cover songs and songs written by lead singer Craig Maierhofer , their own work was a sound which was influenced by some of the musicians they covered. These included Crowded House, Radiohead and John Hiatt. Once their performance ended I decided to head on home as it was quite a long few hours in the sun by that time. This year while strolling through the streets and taking in the various types of visual artwork I found there were some artists displaying their craft which I enjoyed. I kept track of some of these artists and have provided information about five. The artists are listed in alphabetical order. Jeffrey Cannon – I recall seeing the pastel drawings of Jeffrey Cannon a couple of years ago at the Cherry Creek Arts Fair and thought about getting a piece then. When I noticed the works once again it reminded me of that prior art show. There is something which draws me into his pieces and it also provides almost a calming effect to look at the work he creates. Barry Hendrickson – An interesting subject in black and white always draws me in for a more detailed look. This is what I experienced as I walked by Barry Hendrickson’s pictures of Ireland. With a sky which makes the scene quite compelling in the scene it was a quite busy booth. Leif Holland – Strolling by the booth of Leif Holland the subject manner drew me in to see more. Once near the booth and checking out his work I quickly found it was bringing the outdoors inside with his botanical sculpture. With aspen trunks, bamboo is was quite a different style of artwork than the others items on display. Taman Vanscoy – I noticed Taman Vanscoy’s booth out of the corner of my eye as I was walking by in a crowed of people. His style of drawing to me almost looked photographic. I found the subjects to be interesting but quite simple at the same time. Taman was not at his booth when I was there, as it would have been interesting to find out more about his work. William Vanscoy – It is not only about finding the subject to photograph and interpret with your style, but transfering this only a print is also an important part of the process. William Vanscoy does this quite well with a pigment process for his color prints on a velevt paper. From envision to the final product his work brings the viewer a quality image to study and understand. 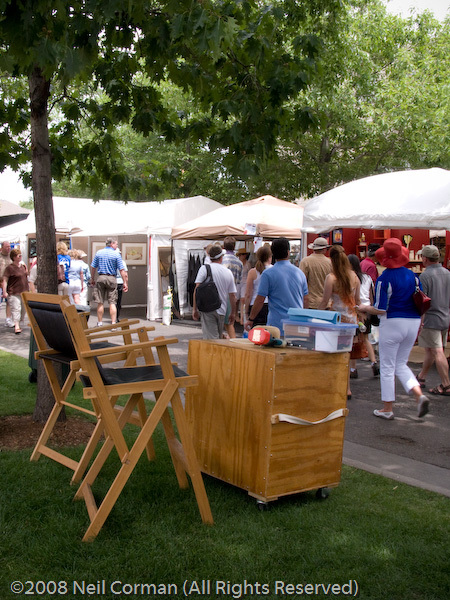 The Cherry Creek Arts Festival is held each year over the 4th of July weekend in the Cherry Creek North area of Denver. If you are in town next year when it is held, definetly check it out.